FARCE. There are nonstop laughs and endless opportunities for cast members to showcase physical humor in this fun circus extravaganza. 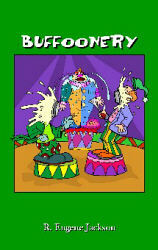 When Mrs. Hatchet, an animal activist, and her rent-a-judge and bumbling bodyguards descend on The Bungling Brothers’ Circus, they manage to confiscate every circus animal?even the clowns’ invisible dog! And to make matters worse, Mrs. Hatchet erases all the tattoos off the Tattooed Man. Bad luck continues when the dimwitted high-wire walker falls and breaks both of his legs because he rigged his safety net upside down. And with just three days left until opening night, the Ringmaster must find a way for the show to go on with the only circus folks he has left: the clowns!